About 610,000 people die of heart disease in the United States every year. In other words, America’s number one killer claims 1 out of every 4 deaths. Not all heart attacks are fatal. But when your heart’s left anterior descending artery becomes 100% blocked, the result is a massive heart attack known as The Widowmaker. Few survive its fatal clutch. Kevin Smith is the rare exception that proves the rule. The arch villain in his own personal superhero comic book narrative, Kevin’s Widowmaker nemesis failed in it’s dastardly quest to claim his young life. Instead, like Spiderman in the aftermath of that fateful bite, it made our protagonist hero stronger — more convicted about his life, purpose, family and art. One might even say it gave him superpowers — a new life animated by an urgent productivity. An emboldened creativity. And, more than anything, a spirit ennobled. This week’s guest beat the odds. But this should come as no surprise for those well versed in the Kevin Smith canon. Because Kevin has always been an outlier — a fiercely independent voice who has been successfully cutting against the grain for as long as he can remember. 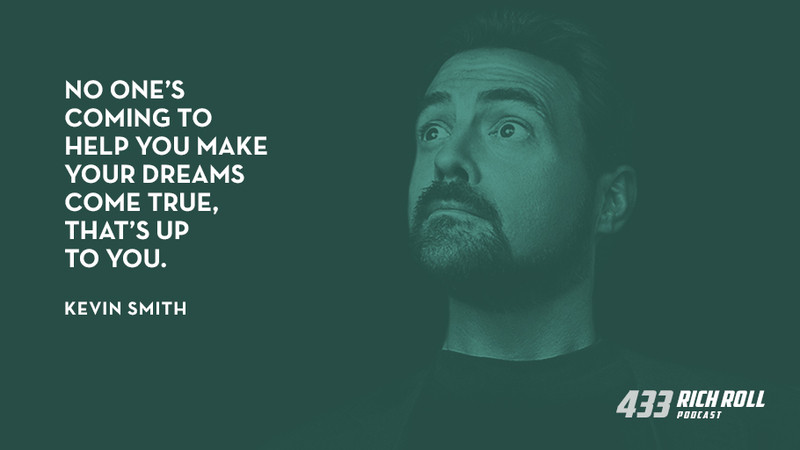 Today this charismatic master storyteller shares his most amazing tale to date — the story of Kevin Smith. For the few unfamiliar among us, Kevin is a filmmaker, actor, comedian, comic book writer, author and early podcast pioneer. In 1994 he burst into prominence with his hyper low-budget comedy Clerks, a film he wrote, directed, co-produced, and filmed in the convenience store where he worked. Premiering at Sundance, it was feted with the festival’s highest award before going on to become an indie cult classic. In addition to countless appearances in both movies and television, Kevin has created a litany of films, including Mallrats, Chasing Amy, Dogma, Jay and Silent Bob Strike Back, Cop Out, Jersey Girl, Red State, Tusk, Yoga Hosers and Clerks 2. Just last week he wrapped production on Jay and Silent Bob Reboot. An iconic and beloved character amongst indie film fans and comic book nerds, Kevin is immediately recognizable and famous for his hockey jerseys, backwards hat and well, his weight. But in February of 2018, between sets of one his stand-up shows, Kevin suffered his aforementioned heart attack. A lifestyle change was needed. Desperately. Harley Quinn Smith (a vegan herself) suggested Kevin adopt a plant-based diet. Kevin obliged. For the first time in ages, he began exercising. In short shrift, he lost 50 pounds. His blood work normalized. And the rest is history. Today we unpack all of it. How maxing out his credit cards spawned an entire career. His perspective on podcasting as one of the very first to embrace the medium. And of course the amazing transformation that compelled me to seek him out. Heart disease is ubiquitous. But as Dr. Caldwell Esselstyn is so fond of saying, it’s a toothless paper tiger that need not exist. So if you feel stuck in lifestyle habits that are leading to your own fateful confrontation with that villainous Widowmaker, my greatest hope is that this conversation catalyzes the required changes well within your grasp to master — because inside all of us is a latent superhero waiting to unleash its fury on the unnecessary evil that is heart disease. As a long time fan of Kevin, it was an absolute delight and honor to spend a few hours with him. I love everything about this exchange. I hope you do too. Final note: I conducted this interview at Kevin’s house, so no video version of this episode. But as always, you catch the audio on Apple Podcasts or Spotify. Athletic Greens: 75 Wholefood Sourced Ingredients, 5 Key Areas of Health, 10 years in development. The Delicious Daily Habit That Sets You Up For A Healthy Future. Healthy Daily Supplement. Invest In Your Health. No Compromises. 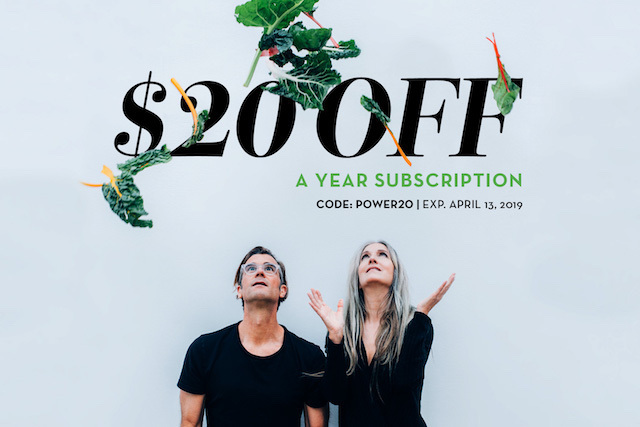 Go to: athleticgreens.com/richroll and claim your special offer today: 20 FREE travel packs valued at $79 with your first purchase. Stamps.com: No more visits to the post office! With Stamps.com you can buy USPS postage online and easily print postage stamps and shipping labels for all USPS mail classes. Get a special offer that includes a 4-week trial PLUS free postage AND a digital scale without any long-term commitment. Just go to Stamps.com, click on the Microphone at the TOP of the homepage and type in RICHROLL. Andrew “Spud Fit” Taylor: ate only potatoes for a year. Listen to our podcast!